Pioneer CDJ-2000NXS Professional Multi Player DJParts - All Variety of Parts that DJ Needs. Adapting to today's variety of media formats, the CDJ-2000 enables playback of MP3, AAC, WAV and AIFF audio files from CDs and USB memory devices, and from DVDs and SD cards as well on the CDJ-2000. A USB port located on top of the turntable enables users to quickly connect an external storage device such as a Tonium Pacemaker™ or a hard drive packed with music files, minimizing the need to bring a laptop computer to performances. Beats Per Minute (BPM) Data – BPM / Tempo information for each song is identified and processed into rekordbox for use by the DJ in preparing and performing a set. Waveform Data – The waveform of each song is identified and then displayed on the bottom screen for quick data visualization and for use with the needle search function on the CDJ-2000 turntable. Tag Info & Artwork – Edit and customize the fi le information to performance needs. Hot Cues, Cue Points, and Loops – Prepare and customize cues and loops as well as create and manage hot cue banks. Playlists – Create, edit and manage customized playlists for various performances. Beatgrid – Utilizing the new Quantizing feature, cue points and loops can be set perfectly on-beat. The Quantize feature ensures cue points are set accurately and automatically, correcting and synching beats during manual looping or a real-time cueing, preventing off beat mistakes. Users can then transfer analyzed music files to their preferred storage media and play them directly from the new CDJ turntable. The software offers song information that can be viewed easily during performances on the CDJ's large display to quickly search and access content by genre, title, BPM, etc. Also, as analyzed tracks are played through the CDJ product, the turntable automatically creates and saves a play history enabling users to review past performances on their PCs. 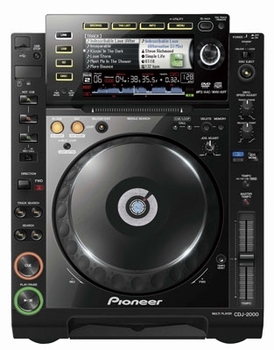 The new turntable features Pioneer’s Pro DJ Link that enables up to four CDJ-2000/900s to be connected via the Link Port to share a single music source, whether it is a hard drive, USB and/or SD memory card. Once linked, users have the ability to quickly find, display and choose the music file from a connected source through the CDJ's built-in display and control knobs. A quick turn of the knob lets users scroll through created files and folders and a push of the knob confirms the song choice. The new turntable feature a 24-bit/48 kHz sound card and HID and MIDI control compatibility via USB port. Up to 35 controls on the surface of the player can be used to trigger other devices, such as DJ effecters and software by way of HID and/or MIDI. The HID controls were implemented into the player for superior interfacing with software, faster communication speed over MIDI, audio/visual streaming and two-way information on the display. HID enables easy, precise and native control of DVS systems such as Native Instruments' Traktor series and MixVibes Cross2 without the need for time-coded discs. LCD panel and Graphic User Interface – The flagship CDJ-2000 features a large WQVGA 6.1-inch full-color 480 x 234 LCD panel for displaying song titles and jacket art as well as detailed track information so DJs can select songs at a glance. The wave data of each song is also illustrated on screen, showing high and low amplitude to further assist DJs. Needle Search – Helps DJs instantaneously get to a specific part of a song with a simple touch of the Needle Search pad. Found directly below the CDJ-2000's high resolution LCD panel, the touchpad lets the DJ "place the needle" and jump quickly to a specific part of a music track. Jog Dial – Adjustments for tension were enhanced from previous models allowing the DJ to further customize the feel of the jog dial from a light to heavy sensitivity. Four illuminated areas on the sides of the Jog Dial aid the DJ in finding the desired spot on the plate in dim lighting environments. To achieve the highest sound quality, the CDJ-2000 was equipped with the audio industry's highly respected Wolfson DAC processor, delivering a very transparent, accurate audio signal resulting in a highly improved signal-tonoise ratio and increased headroom.